Unbelievable. After all that making fun of the Aussie mods, and thinking we were so clever about the direction of the nose tube, it turns out it actually does make a difference which way it goes! The reason isn't structural, it's clearance, and guess which way it needs to go? Correct. Exactly the opposite of the way we have it. We hope you're as impressed by this as we are. The clearance problem is between the nose brace and the steering rack. We installed the brace with the lower end on the nearside, which of course is exactly where the pinion box on the steering rack wants to go. Before we added the cross brace we were able to locate the rack all the way forward in the frame, with the rubber bellows right up against the nose tubes. Now we can't. 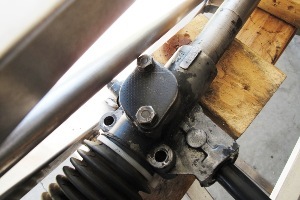 The pinion box contacts the brace first. It almost fits, the rack only comes up 1/4" short, but the fact that it's an issue at all is a total embarrassment. Of course we have options. We always do. The first is obvious. Remove the cross brace and weld in a new one. This has only two problems: 1) removing the cross brace and 2) welding in a new one. With the radiator mount in place, doing either of these tasks with any sort of reasonable expectation of quality is almost impossible, even with our expanded definition of quality. Option 2 would be to do the first half of Option 1, and skip the second half. This is better, but would still be like acknowledging we did something stupid and now we're fixing it. Which of course is true, but why admit it? Option 3, and this is what we're going with, is to mount the rack 1/4" back from its optimal location, just short of contact with the cross brace. It won't affect the steering at all, but the downsides are a) minimal clearance between big chunks of steel, which is not awe-inspiring, and b) it looks really stupid. But the steering rack will be mostly hidden behind the radiator, and minimal clearance isn't a big deal because nothing in this part of the frame should move very much. Besides, if we ever get any hint of contact down the road, we can always dig out the hacksaw. With that embarrassment behind us, we moved on to the further embarrassment of trying to figure out a way to actually mount the steering rack. As we indicated earlier, our rack sits too high in the frame to use book mounts, so we're on our own, which is not a great place to be. Nothing about either the rack or the Locost frame says "mount me here". In fact, it's more like they're mocking us. Nothing lines up. None of the existing tubes are any help. The rack itself blocks any attempt to run a support structure around or through it. Luckily, because of our lack of engineering expertise, we don't actually have to deal with support structures. We just have to build something that looks like it'll work, and we're good to go. 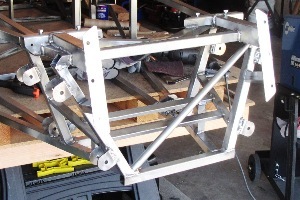 So what we did is weld up a kind of subframe, using a pair of 1" x 1/2" tubes between the nose tubes and the front uprights, and a pair of 1" x 1/2" cross tubes connecting them laterally. So four tubes in all. We aligned the thin tubes in what we believe to be the correct orientation, based on our assumption that gravity is not as important as side loads. But we didn't want gravity to feel left out altogether, so we added vertical tubes between the bottom frame rails and the rack subframe, out of 1" square tubing. Getting everything welded in there was a little like building a ship in a bottle, but we made it work, and now we have this massive structure welded to our Locost frame that weighs a ton and looks like an offshore drilling rig. Not a problem as long as it'll handle a 35-lb. steering rack. Which we think it will. At least we hope so.